Designer Josh Bach's silk tie is inscribed with hand-drawn music written by a composer of the same name. 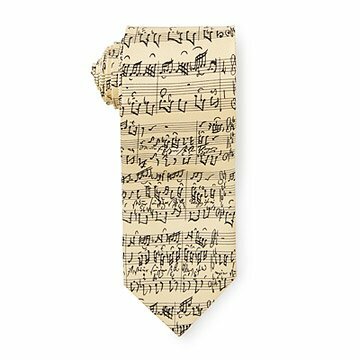 The perfect accessory for teaching, performing, or making beautiful music with business partners, this tie by Josh Bach is inscribed with hand-drawn music written by a composer of the same name. The slightly shiny imported silk recalls the color of 18th century parchment while the sketchiness and quick movement of the notes adds a light spontaneity to even the most serious outfits. Hand finished in New York. It's perfect for a music lover. Great gift for the someone who plays the piano. My son is a piano prodigy. Self-taught, and after 2 years of playing, accepted to Berklee College of Music. This tie was perfect! He knew it was Bach immediately by the handwriting! He wore it Christmas Day to visit relatives. Lovely tie and my friend, a musicologist, adored it. Packaging, however, was terrible. It came in a thick envelope which was folded over in my mailbox. I had to steam out the wrinkles. This tie really needs t be shipped in a tie box or at least hard cardboard packaging. It was a disappointment as I paid extra for shipping. Bottom line: I would recommend this to a friend only if the packaging were improved. A great conversational piece for parties. The recipient of this tie is the president of the Virginia Chamber Orchestra. It will be very appropriate to wear at Orchestra concerts and galas. I purchased this tie as a gift for my brother who is singing at my wedding. I bought this tie for a music teacher. Beautiful silk tie! My sig other LOVED it!